PhD candidate Espen Bøe has looked at the effect of cardiac resynchronization therapy (CRT) in heart failure with normal and abnormal electrical conduction. In failing hearts with narrow QRS and no ventricular dyssynchrony, CRT improves filling, but worsens systolic function. In heart failure with ventricular dyssynchrony, CRT makes the heart pump more efficiently. A novel echocardiographic method reveals coronary occlusion. (1) Cardiac resynchronization therapy (CRT) aims to synchronize the left and right ventricle. 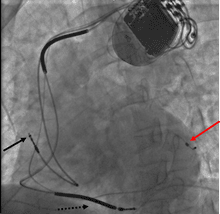 Pacemaking with a CRT might not be effective for heart failure patients with narrow QRS and normal electrical conduction, according to the first study of Bøe’s doctoral thesis. In an experimental dog model, left ventricular end-diastolic volume increased during pacing of the left ventricle, but not during biventricular pacing. However, both left and biventricular pacing induced dyssynchrony, which led to reduced stroke work. (3) CRT is effective when electrical conduction is abnormal and the ventricles are dyssynchronized. In dogs with heart failure and dyssynchronized ventricles, CRT made the heart pump more efficiently. (2) A novel, non-invasive method for measuring myocardial work index reveals coronary occlusions in patients with acute coronary syndrome without ST-segment elevation. The echocardiographic method developed at Oslo University Hospital was tested in 150 patients, and identified 22 of the 27 patients with coronary occlusions confirmed by coronary angiography. The method was superior to all other echocardiographic parameters. (1) Boe, E., Russell, K., Remme, E. W., Gjesdal, O., Smiseth, O. A., & Skulstad, H. (2014). Cardiac responses to left ventricular pacing in hearts with normal electrical conduction: beneficial effect of improved filling is counteracted by dyssynchrony. American Journal of Physiology-Heart and Circulatory Physiology, 307(3), H370-H378. (2) Boe, E., Russell, K., Eek, C., Eriksen, M., Remme, E. W., Smiseth, O. A., & Skulstad, H. (2015). Non-invasive myocardial work index identifies acute coronary occlusion in patients with non-ST-segment elevation-acute coronary syndrome. European Heart Journal-Cardiovascular Imaging, 16(11), 1247-1255.